Nov. 1: Will any of us venture up to National Grange in Vermont to see the Seventh Degree? Dec. 6: Sleigh Bells Ringing. Potluck Supper, 6:30 P.M.
Our Worthy Master, Kathy Tefft, was under the weather with a bad stomach bug. Our able-bodied Overseer took the helm and did a fine job. 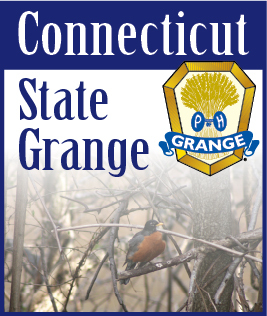 We voted to pay our bills, one of the co-chairpersons, Nancy Beebe, gave a wonderful report on proceeds from the Grange Grill. She also gave a final report from the plant and food sale. What a relief the high humidity and temperatures have gone. Since our Ceres was also sick, we will drape our charter at our October meeting for Terry Firgelewski. Our Community Service book was sent on time.